The Mughal emperor, Shah Jahan, who also built the Taj Mahal, began the construction of the Red Fort in Delhi in 1638 and completed it in 1648. It is huge, with a circumference of 2.2 kilometers (1.36 miles), and there is no doubt that it is magnificent and very beautiful. Islamic art, wishing to avoid idolatry, does not depict animals or humans, but instead shows intricate, extraordinarily delicate carvings of geometric forms and verses from the Koran. These cover every wall, and their repetition of patterns creates an extraordinary vision of great beauty. I did recall of course that there was a Moslem invasion, and over a number of centuries Moslem armies poured into India, in the north, and, into parts of the south of India as well. I’d never thought much about it. So here was the history of India. In guide books and a dozen online descriptions of the Red Fort, I have failed to find any mention of the ancient temple that used to be there—only glowing descriptions of the magnificent Islamic artwork, the history of Shah Jahan, and the Moguls. Certainly no one could argue that the artwork carved in red sandstone is not magnificent. It is spectacular. The British came along later and took over the fort—conquerors too. 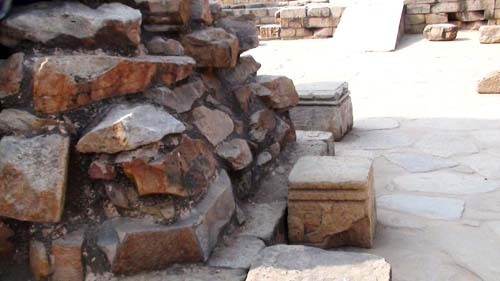 Before Shah Jahan constructed the Red Fort, at this site was another Islamic fort, Salimgarh, the remains of which are still there, built in 1546 AD by Salem Shah Suri. It was built along the Yamuna River at what had been a good defensive position. Within the enclosing walls of the Red Fort, stands the highest stone tower to be found in India, Qutub Minar, built in the thirteenth century by Qutbuddin Aibak, standing 72.5 meters (238 feet) high. Entrance to the Minar is closed now because there had been a number of suicides from the tower, which has an ethereal beauty. 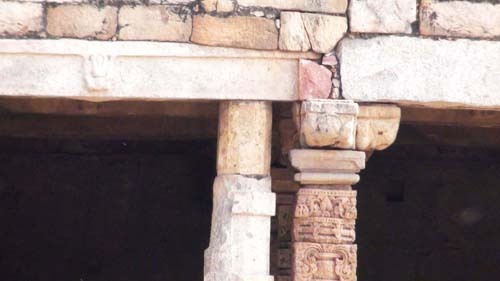 Within a few feet of Qutub Minar, stands the Iron Pillar, put there much earlier between the fourth and fifth centuries AD; the pillar is entirely of iron, yet it has never rusted. No one can explain how that is. 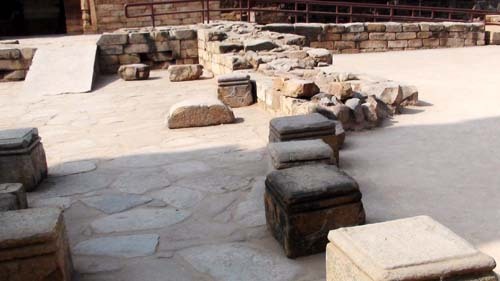 Set up as the flagpole of a Vishnu temple (which has to mean that there was also a Vishnu Temple on this site—also destroyed), it was dedicated to the memory of King Chandragupta Vikramamditya, who reigned from 375 to 413 AD. This is recorded in Sanskrit on the pillar itself. In another area, on the outside of a wall, in a very tiny cage, can be viewed, if one gets down on one’s hands and knees, a little icon of Ganesha, perhaps a foot high. There Ganesha is the last remaining pre-Islamic sculpture in the Red Fort. I asked the guard why Ganesha was shut up in such a small cage, as if he were confined to prison. Would it be very hard, I thought, to build a tall glass house and put a proper sign beside it, in honor of Ganesha? The guard smiled at my silly question about the appropriateness of Ganesha’s cage, and said that it was “for his protection.” Who knows what a tourist will think of next? Despite the unparalleled magnificence of the Islamic art carvings in sandstone, I left the Red Fort in a reflective mood. A lasting impression was a sense of insight and clarity, having seen for the first time a different view of the history of India. The battles between the Moslems and the Hindus were not simply wars of the distant past that happened who knew when—in some far-away, irrelevant, abstract time, existing only in the pages of books, that should certainly be forgotten since they have no bearing on the present. 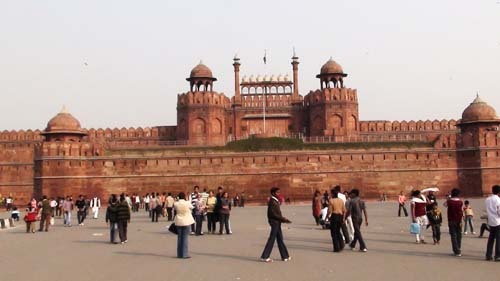 Instead, though tourists milled about barely giving them a second glance, the great stone blocks that lay scattered on the ground inside that one area of the Red Fort, like blocks cast down by a giant child from a toppled tower, were a witness to history.